What is hyperlexia? 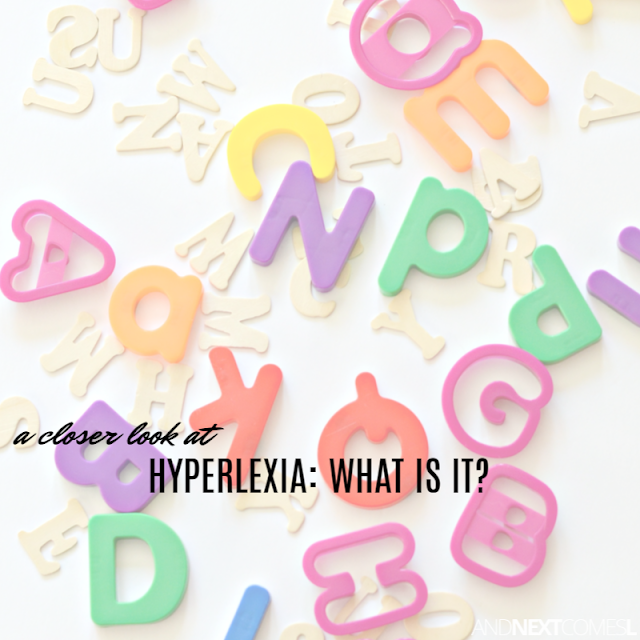 Come take a closer (and more personal) look at the hyperlexia diagnosis. My son has hyperlexia and hypernumeracy. You've likely never heard of those. Either did I until November 6, 2014. But, like me, you have probably broken down those words into pieces and figured out their meanings accordingly. So I took the first logical step when given an unfamiliar diganosis: I googled it. Here I am, after months of wait lists, with some unfamiliar diagnoses, typing those two words into Google only to hit another roadblock. There is practically nothing - yes, nothing - for me to read on the topic beyond the basic definition. Especially on the topic of hypernumeracy (there are currently 63 search results in Google on this particular topic). How disappointing is that? I've quietly struggled for years trying to understand my child’s extreme fascination with letters and numbers, his irrational outbursts, and lack of conversation. And then I am finally given a diagnosis (okay, more like multiple), but end up feeling just as lost as always. The psychologist basically handed me a piece of paper and said, “See you in three years. A full report will be mailed to you shortly.” So between that and the lack of results via Google, I am disappointed in the information on hyperlexia and hypernumeracy that is available to parents like me. Less than two weeks later, I found myself at a meeting for parents at Autism Services. At this meeting, each parent shared their name and a little bit about their child who is either on the spectrum or is waiting to be assessed for autism. I mentioned hyperlexia and hypernumeracy, as I feel it’s important to share these details. I’m glad that I did because after the meeting, a gentleman who was sitting behind me approached me to discuss hyperlexia. Like me, he had never heard the term before. He was interested in reading more about it because his son had been intensely obsessed with numbers. This chance meeting was a light bulb moment for me. I knew that I had to write about hyperlexia. I had to write about it not only as a way to help me understand it myself, but to also hopefully connect with other parents dealing with hyperlexia and/or hypernumeracy. My hope is that I can create a great resource for parents just like me, trying to navigate the crazy, wonderful world of hyperlexia and/or hypernumeracy. Basically, my son started reading and spelling words before he turned two. It was all self-taught. Yet, he cannot carry on a conversation, answers questions with inappropriate answers, and sometimes appears as if he didn't hear me ask a question at all. I realize (and willingly admit) that I do not know enough about what hyperlexia is. And honestly, I don’t think a definition does it justice. Yet, I realize many of you won't know what it is so I highly suggest reading this hyperlexia pamphlet for more information. So although I cannot define hyperlexia confidently and still don’t really know what it’s about (but I'm learning! ), I have been living, breathing, and experiencing hyperlexia for five years. That is what I’m going to share with you. I’m going to show you what hyperlexia and hypernumeracy look like. Watching movies in their entirety, including the credits, because the credits are filled with letters. Naming the movie that you want to watch by the length of the video playback instead of its title. Yes, calling a movie 1:26:32 instead of its proper title. And yes, he was always that precise. Walking around the block when you're just 1.5 years old and looking at license plates. Not just looking, but tracing your fingers along every single letter and number on the license plate. Not just one car either. Every single car you walk past. Turning any kind of loose part into letters and numbers. See here, here, here, here, here, here, here, and especially here. Reading and spelling difficult words at an early age. And doing it correctly. Never having a letter reversal stage when learning to write. Spelling words correctly, even if you've just turned two. Learning to spell in another language when you don't speak another language and haven't been taught it. Never having cute kid-invented spelling when learning to spell and write. Flipping through every single page in a book before being able to move on to a new task. Flipping through a new book to find out how many pages there are, browse the table of contents, and peruse the index. Then referring to those books by the number of pages instead of its title. When asked to draw a picture of a big cat, writing the words "Big Cat" instead. Going for a walk, passing under street lights, only to have your child say that's #10 or that's #12 because, believe it or not, if you look up at that street light, you will find a number. It's not a particularly large number, but he's spotted it. Having meltdowns because the clock in the kitchen says 11:20 and the clock on the thermostat says 11:22 and the clock on the microwave says 11:23. Covering all the digital clocks in the house for months because, no matter how hard you try, you can never get the darn clocks to stay in sync and show the exact same time on each one (see above point). Writing the words "My Duck" with magnets after fighting over a toy duck with your younger sibling. Your age at the time: 3 years, 1.5 months. Your brother's age: 14 months. Too bad your brother's not old enough to read! Taking a blank notebook, writing the page numbers for each page in the book, and then writing "The End" on the very last page. Doing math well beyond your age. Asking the pscyhologist if she loves fractions and you just turned five. Making an entire clock using plain wooden blocks. Skip counting by obscure numbers, like the number 12, at age four. Asking him, "How many times do I have to tell you that?" and he responds with a precise, "291 times." Well played, my son. Well played. And to give you the full effect, I made a video! Hyperlexia and hypernumeracy are both extremely fascinating. Some of the things that J does absolutely blows me away and oftentimes, I don't take a photo or write down what he does. I want to consciously take more photos of what he does and keep a better written record of things he says. To do so, I will be sharing photos of his hyperlexia and hypernumeracy on social media using the hashtag #thisishyperlexia. If your child has hyperlexia, then please join in on the fun. Tag your photos on Instagram with #thisishyperlexia. I would love to see them! Or if you're simply fascinated in learning and seeing more, then be sure to follow #thisishyperlexia for photos, as well as useful hyperlexia resources and articles (see #thisishyperlexia on Twitter). Wow. That's crazy. I've never heard of this before, and I'm pretty sure that I don't know anyone who's kid struggles with this, but I pinned to my homeschool board. Thanks so much for sharing this info! It is crazy, but so fascinating! Thanks for pinning, Raia! There isn't much in that section yet. I was just setting it up in preparation for this post and all that I plan on writing about it. And thank you. He is truly an incredible little person. I'm so proud of him! So anxious to read more! He's such a special guy! He truly is. Thank you for your support, Devany! My goodness, this is fascinating! I will be sharing this so you can reach your goal. As you said, as rare as it is, I'm sure another parent or teacher would love the first hand information. You may be starting your own online community soon. That's my hope! I do want to connect with other parents and hopefully reach new parents who may be experiencing hyperlexia and not even know it yet. What an amazing and succinct explanation for a diagnosis that I'm sure many of us have never heard of before, or did not completely understand. As i read your post, I kept thinking, "What a lucky little boy, to have this woman as his mom! " All the best to you! Thank you so much for your wonderful comment! You have no idea how much your kind words mean to me. I appreciate you taking the time to comment. I agree with LB's mom. J is lucky to have you for his mama. Many parents forget to see the awesomeness that comes to the top and focus on hardships. Thank you so much for sharing your story. It will truly help so many families! I found you through Pinterest. First of all, HUGS. Secondly, are you on Facebook? There is a group called the Hyperlexia Parents Network and it's a really great resource and place of support, especially including ASD. Things you'd never think of at this point including dealing with the school system and IEPs and things to ask/do, etc. Great stuff, but we felt a little bit disconnected from the other stories being shared. I kept looking and found a Type III board as well and instantly felt at home, so I follow both. Just wanted to share with you...no matter what your need, there's probably a FB group for it. Check it out. Hope to see you on there, and Godspeed on your journey! Yes, I am a (quiet) member of the Hyperlexia Parents Network. I mostly just read and follow, but it is a great group and was the first resource that I found after my son's diagnosis. I joined the Type III group too to check it out. Thank you for the suggestions! I have a son with hyperlexia who's 24 now. When we was diagnosed at age 4, we were put in touch with a group of parents in the Chicago area. They had founded American Hyperlexia Association to try to get the word out. I became president for two years, my ex-husband made a website. That was when the web was in its infancy! We just couldn't keep the organization going. We were all volunteers with special-needs kids. I still have some of the newsletters with what was great information at the time. We had a couple of conferences. I'm surprised and sad that 20 years later there's not more information available. If I can help, let me know. And it really is sad how there isn't much available to parents and educators. I think what makes me the most upset is that I never stumbled across the term when searching google about things my son could do. That's just not right. And I imagine there are many other parents that are in the same shoes as us, perplexed by their child's abilities and unaware that hyperlexia existed! Thank you for all of your information. I have been searching to put puzzle pieces together for 3 of my sons who have Tourette Syndrome. I was stunned to see that this could be a disorder associated with Tourette Syndrome. It was like snapping puzzle pieces together for my 2nd son who has TS but also have issues with oral fluency, oral comprehension, and conversations. It will be great information to take to the Neuropsychologist, and see if it will be a fit to help us know what to do. I am also a Special Ed teacher, and this is fascinating to me for many levels. I am grateful to put this information in my pocket to use for students and identifying ways to assist them. Thank you for sharing your information and research. This is really interesting. I have a degree in maths and teaching, been teaching for 18 years with children aged 5 to 11, and have still never heard of it. Don't worry, you're not alone! My son's teacher has been teaching for a long time too and had never heard of it either. Obviously, we need to raise awareness for hyperlexia! If you haven't, try turning on subtitles for DVDs and Netflix (use the hearing impaired ones not the english-as-foreign-language ones so they match the audio track exactly). I think that was very helpful for my son. I will definitely check out your list of resources! Thank you! And yes, we do a lot of subtitles. Funny you mention the subtitles on Netflix. I now have to remember that some shows have bad words that show up on the subtitles and of course my three year old being the self taught phonics king can pronounce them perfectly and has done just that to my horror. This means no more shows/movies, even with the volume off, that are possible F bombers. Wow! My son has always had a fascination for letters, but nothing quite like this! It sounds as if you have an amazing little boy there! I know your posts will help others in the future! I have heard the term hyperlexia but not hypernumeracy. Although now, looking back, I recognize at least two children with whom I have worked in the past (I used to work with children on the autism spectrum) that seem to fit the diagnosis for one or both. I worked with a 3-year-old two years ago who was fascinated by numbers and counting and could do addition and subtraction well beyond his years. It is fascinating how differently our brains can work! Thanks for sharing, stopping by from Sharefest. It is fascinating to see how we are all wired so differently, I agree. Yeah, that's my son. Tonight at supper he was doing subtraction with fractions. He's five! Thank you for this article. Your son sounds amazing. My son is 29 months and I'm positive hyperlexic. His play therapist says she thinks he is as well. He has been obsessed with license plates and counting since 18 months and developed letter skills closer to 2 years old. He can spell, identify from spelling or read up to 25 words and even if he can't spell something, he can give me the first few letters of a word from sounding it out. I hazard a guess that he doesn't know what most of the words he uses actually mean but It's been a delightful and strange red flag as we pursue an autism evaluation. I love how happy numbers and letters make him. Thanks for the resources and I am looking forward to following you. Sounds like you have an amazing little guy on your hands too! And you're lucky to have heard the term hyperlexia so early. I so wish I knew that it existed back when my son was around age two. It would have helped in so many ways! I wish you luck on your autism evaluation journey. A friend directed me here. My daughter has both hyperlexia and hypernumeracy; as well as aspergers, spd, and a pragmatic language delay. She is 8 now, diagnosed several years back. I have found it extends beyond letters and numbers and is more symbol based (at least in her experience.) She now studies Chinese and excels in music. Anyway, I will tag some photos on IG and follow you there. She is older now and has come so far. I remember reading the book "Reading too soon" by Susan Martin's Miller when she first received the diagnosis and it was a little helpful. Other than that...not a lot of info there. Anyway, I look forward to following you and chiming in with what I know where I can and learning from you as well. I'm still learning about hyperlexia too, but I don't think it's something they outgrow. I could be wrong. And I guess time will tell with my son. As for your second question, it's usually diagnosed hand-in-hand with autism, but it can occur without too. If you go to my hyperlexia resources page (link at the top of the blog), there is an article by Dr. Darold Treffert that talks about the three subtypes of hyperlexia. That should help answer any additional questions that you may have. And thank you! He is definitely an incredible little person! From my own reading (as I suspect my almost-3-year-old is hyperlexic; I already have had him in speech therapy due to a moderate speech delay) hyperlexia IS usually outgrown (as far as any deficits it may cause) if the kid gets assistance from an early age, i.e. speech therapy, social therapy. I've been a teacher for almost ten years, and had never heard of this. But I find it incredibly interesting. Your post made it easier to understand what it is, but also was fascinating to read. As a mother, I admire your openness of writing about this as you're discovering more about it yourself. I am looking forward to hearing more about how you move ahead with your son so that you can both help him expand on this amazing diagnosis but also learn to live with it comfortably so that some of the things don't preoccupy him as much when you need him focused on other things. Aw thanks, Kate! What a sweet comment to read! The diagnosis alone has helped in so many ways, giving me a better understanding of how to help him communicate better. It's also making me a much better parent! Happy kids, happy mom, right? Does this fall under autism spectrum disorder then? Just curious because my nephew's son is exactly like this. I just went back and read some other comments. I see where you said it is usually diagnosed hand-in-hand with autism, but not always. I would think that the expressive language component would be the key to whether the child would be considered on the autism spectrum or not. Hyperlexia is often diagnosed with autism, but not always. Most kids with hyperlexia express themselves through echolalia at first, which is also common in autism. Dr. Darold Treffert, for example, writes often about how some kids with hyperlexia show autistic like symptoms that they eventually outgrow. It's fascinating for sure, so be sure to check out our Hyperlexia Resources section at the top of the blog to read more about the diagnosis. Not necessarily. My son (3) doesn't display any of the sensory issues often found along with hyperlexia and is not on the spectrum. He just has the speech and social quirks/delays that are usually found with hyperlexia. Many kids with autism also have hyperlexia, but not all kids with hyperlexia are on the spectrum. He sounds like an incredible little boy. What a fascinating topic thanks for sharing. He certainly is, Amy! And I agree. The more I read and learn about hyperlexia, the more fascinated I become! My mom sent me your blog entry, as it seems our boys have a lot in common. It's fun to know i'm not alone! :) Thank you for sharing! My 7.5 year old has autism and hyperlexia. We discovered at 2 years old that he taught himself to read, but believe now that he learned much earlier. Even after 5 years I am still amazed by it all!! It sure is amazing to watch how they learn! Copying across my comment from The Mighty: Hello! I'm hyperlexic. I could read before I could talk, and I can't remember a time when I couldn't read. I have to read anything in print that comes across my field of vision, which makes me a rather hazardous driver. Luckily, I can read very quickly, scanning a whole billboard and having it in my head straight away. I'd be happy to answer anyone's questions about what it's like to experience hyperlexia. So interesting about the numbers! Also, I never thought about the impact hyperlexia would have on driving. Luckily, I won't have to deal with that for another 11 years, but thank you for raising that concern! I would love to know how it is to be an adult with hyperlexia. I have a 3 year old with hyperlexia. So would I, Deborah! I would love to talk to more hyperlexics as adults to get some insight. This is brand new information and you've explained it so well. Dealing with hyperlexia seems to be both frustrating and fascinating. Very eager to read more from you. It is definitely fascinating and frustrating at the same time. Thanks for reading so many posts today! Your son sounds so similar to mine. Another thing mine would do is referred to stores/places by their address instead of their name, for example if he wanted to go to toys r us, he would say let's go to 4601 or if he wanted to go to IHOP he would say 1536.....it was hard to figure out, but I'm learning.....there are challenges and fascinating moments....it's an exciting ride! Oh my goodness yes! He always calls our house by the house number and he even referred to our backyard neighbor's house by the house number. He said something like, "They're always barbequing at 534 house." I was like, "Where??" Then I figured it out because sure enough the neighbors were currently using the barbeque. Never a dull moment around here! I am so glad you wrote about this. My son is almost 3 and is hyperlexic. It's very hard to find info. People think he's such a genius, and he is, but he struggles to communicate without letters. So glad I found your blog! Liz, I am so happy that you found it too! I really wish there was more information and support available to parents and educators because their brains work in a truly unique way. My son too. Almost 3, has a huge vocabulary and excellent memory and can spell words like violin, umbrella, elephant, and count to 100, but his conversational and social skills just aren't nearly as developed. He's been doing ST for a year and is going to have ST and other therapy in preschool too, to work on his social delay. He's incredibly smart but learns differently from other kids to be sure. Having "hyperlexia" as a label is a big help. Some have suggested autism spectrum (and clinicians have said no) and it just isn't him; he doesn't have any sensory issues, almost never tantrums, is very adaptable and flexible, etc. He just experiences the social and language quirks. Everything I've read has said getting kids with hyperlexia therapy from an early age is the best way to help and most hyperlexic kids do end up being considered neurotypical, with little to no special assistance needed later in childhood once they're done with therapy. Thank you for a very interesting website. We noticed our 3-year-old son could read at the age of 3y2m (but how long had he been reading without us noticing it?). He doesn't have any autistic traits, and he understands fully what he reads (and connects it to previous knowledge). Now he's learnt some times tables and can sum 20+10 and the like, though he's not as enthusiastic as those children parents describe in previous posts. Here in Spain where I live I'd never heard the term hyperlexia, and I dread telling my child's doctor in case he's misdiagnosed, mis-pigeonholed, misunderstood and a long list of mis-fortunes. Keep enlightening us please. I don't think hyperlexia could ever be a bad diagnosis, to be honest. 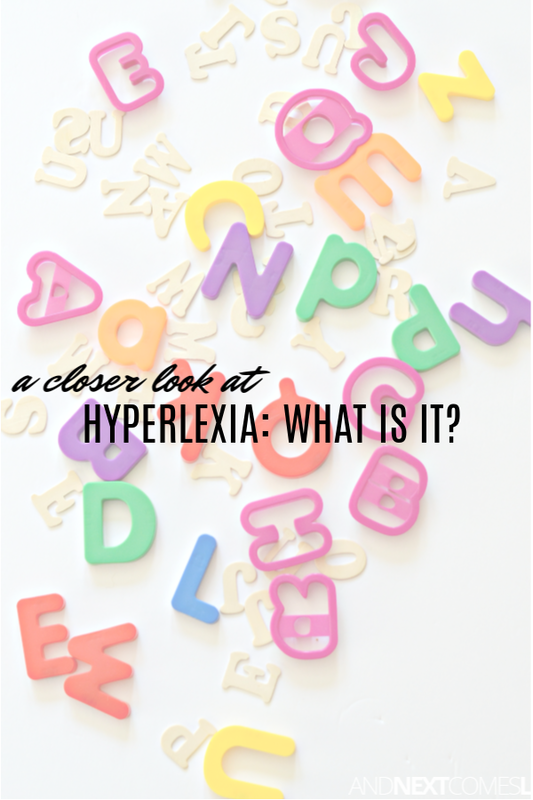 For me, a hyperlexia diagnosis was helpful because I had never heard of it before and was desperately trying to figure out what was going on with my son. Hyperlexia was that missing piece. As soon as I had that piece, it was like I finally had the right strategies to help him. So I don't think telling your child's doctor about the possibility of hyperlexia will pigeonhole him in anyway. You might be right. I'll let you know when I tell her. My daughter is 3.5 year old and hyperlexic. she is very smart,but her communication is limited. what are the strategies you followed for your kid to communicate better. I am new to this blog, so any information would be useful. - Using social stories to help with social issues, new experiences, etc. - Practicing social scripts of basic communication skills like "What's your name?" or "How old are you?" - Providing lots of things to doodle with: chalk, notebooks, Magna-Doodle, etc. I have lots of great hyperlexia resources here: http://www.andnextcomesl.com/p/hyperlexia-hypernumeracy-resources.html including some free printable WH questions to practice with your daughter and a link to a really great pamphlet about strategies to use at home and in the classroom. I commented elsewhere before seeing it was a repost of your actual story here. I am an older adult with hyperlexia. Of course it was never diagnosed then. I had to figure it out on my own, after my own son was diagnosed with autism. Perhaps you saw it on The Mighty? Regardless, it's so nice to meet you. I’m in the UK and I’ve not yet figured out how much people over here are aware of hyperlexia. I’d never heard of it until I ran into issues with my son - I’m a little bit worried how the educational/medical professionals - as in the psychologists and speech therapist are primed to deal with this in my country. Actually my son has so far only been to one speech therapy session (which was good) – a month ago, and the next is scheduled for after Christmas – my son is now 4 years and 4 months and recently started school. When he was around 2 years old we were starting to get a bit worried about him not developing his spoken language, although we would notice him doing lots of “clever” things so did not worry too much, and his vocabulary was quite extensive – yes he did lots of stuff that fits into the autistic bracket, but he has always been quite affectionate and likes social occasions – running around with lots of kids, although often thinking they were playing some kind of chasing game, when they were not. By 3 years old – I thought I’d teach him to read, as I thought this might help his speech development - and consequently went out and bought some books for this task… only to find that he could already read… Oh, to add to the fun, we are also raising him bi-lingual, his mother’s first language is Spanish - we have subtitles on the TV a lot and I think he just picked up the English from there, although he can read in both languages perfectly well. His fascination with numbers was also non-stop, every morning I’d be woken to a math question, what’s this plus this etc. every toy would be turned into a number, and he would spot numbers everywhere - around 3 years 9 months I remember him doing lots of skip counting (actually he’d been skip counting for months) – and whilst at his nana’s house I always remember him skip counting down the stairs, one step at a time, in 91’s, all the way up to 1000 and something – It sticks in my head because I couldn’t do it. Hi, Dave! Sounds like you have an incredible little guy! I will answer your other questions in the next comment. Dyan, I read that your son was also hypernumeric, I think you’re the only person that I’ve seen mention this term – I know little about this, if you’re hyperlexic are you hypernumeric or is it common to be both or do they also exist separately – like, can you just be hypernumeric?. My son has yet to be diagnosed with anything, but type III hyperlexia seems to fit, he had the precocious ability to read early, but I’d say his comprehension is more like that of a child a year younger. I’ve been reading a lot about hyperlexia and the different types mentioned by Dr Treffert – I also wonder if type III is also on a sliding scale, where you can be more type III than another person with type III, if that makes sense. By about 3 years 10 months my sons fixation with numbers has backed off loads, he can still do the math, but it’s not as intense – In fact he seems to be adjusting quite well into school, although I do worry about his comprehension and whether or not this makes him a bit vulnerable in certain situations. I’m a bit scared that as the kids grow older we will notice more of a gap and then he might not fit into class so well – on the other hand, as the prognosis for type III’s seems to be positive – so I’m hoping his comprehension catches up. Right now we’re working on reading books below his reading ability and focusing more on understanding the content. At the speech therapist he was shown some pictures, an example would be – 1 boy sat on a wall and 2 sat on chairs, and then underneath, the sentence – who is sat on the wall? He would read the sentence himself (instead of the therapist) and answer the question – his comprehension could grasp this. Where it fell down a little was when he was asked a sentence with multiple actions – so there would be 2 teddy’s, a chair, and a table – and he would be asked make red teddy jump on the table, put blue teddy under the chair – so that process of choosing a teddy, choosing the object (table, chair), and choosing an action, he struggled with – so we’re also working with similar exercises to help this. Regarding the hypernumeracy, I simply don't know much about it because frankly, there's like zero information available about it. I do know of one other person who uses the term and that is Daniel Tammet. He has hypernumeracy and has written quite a few books. His book "Thinking in Numbers" is an interesting read. However, based on what I have seen and heard from other hyperlexic parents, not all would be classified as hypernumerate (or would it be hypernumeric? no idea!) as well, although most hyperlexic kids have an interest in numbers as well. However, for J, his fascination with numbers is more dominant than it is with letters. And the things he can do and understand regarding math and numbers is light years ahead of anyone I have ever met that is the same age as him. So my gut instinct is to say they can exist separately and that not everyone who is hyperlexic will be hypernumeric, but that is merely my opinion. We learned about hypernumeracy during my son's autism diagnosis and was given the label, in addition to the hyperlexia one, from the psychologist. The types proposed by Dr. Treffert are extremely interesting and I do think there is a sliding scale, or spectrum, of hyperlexia, regardless of type. For instance, my youngest son K started reading early as well. He was just around age two. However, he can't spell like J could and wasn't nearly as fascinated with letters as J was. He was, however, really into logos. I still find him spelling the word Samsung everywhere! Would he be classified as hyperlexic? Probably. His reading was all self-taught, just like J's. But his hyperlexia doesn't seem to be as intense, if that makes sense. The prognosis for kids with hyperlexia is good, regardless of the type. I personally don't worry too much about the type. Instead, I look at hyperlexia as a practical label. One that tells me how to best understand my child and how to help him. Once you know your child has hyperlexia, then you know that using the written word is tremendously helpful for connecting and engaging your child. Yes, there will be difficulties in comprehension, WH questions, etc., but they do seem to catch up in those areas eventually. Just keep asking him questions about what he is reading to make sure he understands. As for feeling scared that the kids will notice a difference, I hear you! J is in grade two and already the kids are talking about how he is "the smartest kid in the class." They definitely notice, even at this young age. J doesn't really notice that he is different, but we have always tried to encourage him to embrace his unique talents. He also uses his advanced math and spelling skills to help other kids in his class, which boosts his confidence and has been tremendously helpful for his social skills. But to be honest, I am still a wee bit terrified of how things will be in a few years. Kids can be cruel, I know that. And honestly, I would love to chat more with other parents of older hyperlexic children to learn more about what to expect. Anyway, our kids are amazing and I'm so happy to have connected with you! Hopefully my response was semi-helpful. I am tired so I imagine there are a few rambling thoughts or typos above. I’ve had some time to digest what you said, and it was helpful. You write about it with a lovely positivity, something that I’ve been missing. I feel a bit bad, I’ve maybe looked at it the wrong way, like a disadvantage almost. You are right, our kids are amazing - and being a little bit different, well that can be fun. I plan to enjoy it anyway. I’m currently checking out, your tips to improve comprehension – and also Judy and David’s strategies. Oh btw, sorry for another comment but i was curious about (and this is something that we've struggled with) hyperlexia and going to the toilet. I read somewhere (not sue where) that hyperlexia and toilet troubles were common. My son struggled immensely with this, that is, holding in his poops - and even now at 4y4mths he still occasionally holds it. I've made and laminated a "poo poo chart" and fixed it to the bathroom wall so that we can monitor his activity - But sometimes he will still hold it and when I ask him why he replies "I don't know". I was just wondering if you were aware of this issue? It seems like toileting issues are common with hyperlexic kids. No idea why! From what I can recall (I try to block out memories of J's potty training since it was so agonizing), we wouldn't ask him to go to the bathroom. Instead, we would remind him to go the bathroom before leaving the house or heading to school, etc. Essentially we created a routine for him. A visual schedule with written steps also helped him master the separate steps like wiping, flushing, washing hands, etc. Also, if he is holding it in, then I wonder if a foot stool would help? Slide it under his feet while he is pooping. Apparently raising feet and squatting is the best position for pooping so using a foot stool is actually recommended for everyone. I haven't done the research on this particular topic, to be honest, but I have noticed it is helpful for our kids, especially since their feet dangle and cannot touch the ground anyway when they're sitting on the toilet. And I love that your son says "I don't know" to your questions. I get that exact response for pretty much every single WH question that I ask J! Thanks for the reply - The pooping is getting better now, it just seems to be getting better with time. I tried everything, from even buying a doll that cries "we named her Mary", and some fake poop, then getting O to help her go on the potty as she was crying and needed a poop... It maybe helped a little, i'm not sure - what would i give to see inside the mind of a hyperlexic kid and see the thought process??? Because O does seem to like structure and routine - yet sometimes there does not seem to be any logic. Interesting though, about your visual schedule - i will write one too. O does love to ask me the order in which we are going to do things - like when we go to school - he asks, what will we do first? "take off your coat" what next? etc. Yep, the I don't know responses - Example: O, who did you see in school today? i don't know - OK, tell me 3 people you saw in school today, we need to do this before we read your new book. Blake, Kara, and Nathan. Me thinking, why didn't you say this in the first place? However, he will name the same 3 kids if you ask him the same question the next day. Actually though, I do think a lot of kids like to give an "i don't know" response. True that most kids use the "I don't know" response, but I find with our hyperlexic kids, we have to be specific with our questions or else they really don't know how to answer it. So just like you asked about three people he saw in school, I do the same thing. I ask questions like: Did you have gym today? What game did you play in gym? Who did you play with during first recess? What was something funny that happened in your class today? Did anyone wear a green shirt today? Things like that. Usually when I ask a question like that he ends up elaborating and telling me quite a bit about his day. Anyway, glad the toileting is going a bit better. It does get easier with time. I know that's not helpful when you're in the thick of things, but do know it will all be in the past before you know it! I remember the moment I figured this out with my son. I had pointed to a picture of an animals face (can't remember what animal it was. Let's say a lion). I asked him "what is this" (looking for the answer: "lion") and he struggled and struggled. "What am I pointing to?" He couldn't tell me. When I gave up, I heard his little voice say "a nose?" Oops. I should have asked what animal it was, instead. Lesson learned! I have hyperlexia, and I've known about that for years. What I didn't know was how much it was affecting my comprehension. It was also something my teachers never figured out. I didn't get into gifted reading in 3rd grade because of it, and I'm sure my teacher and mom were confused why. They knew I was a voracious reader. My 11th grade English teacher was also confused - she knew I had read the book, but then I got a D on the comprehension quiz. But I think that teachers see a fluent reader and think a) they don't understand and b) they have to help the non-fluent readers because that's what they're taught in school. I'm actually a librarian now (somewhat ironically, I suppose), and a couple of years ago I decided I needed to do something about my lack of comprehension. I heard about a program called Visualizing and Verbalizing - https://lindamoodbell.com/program/visualizing-and-verbalizing-program - and it really changed my life. When they tested me, just two years ago, even as an adult, my reading comprehension was at a 5th grade level. My fluency was over a 12th grade level (that was as high as the test went). After 6 weeks of 2-4 hours a day of practice using their system guided by their teachers, I improved to an 8th grade reading comprehension level. It totally changed my life, as cliche as that sounds. Of course, since this was just two years ago when I basically had to relearn how to read for comprehension, I'm still slow at processing and comprehending, but I'm doing it so much better, and I just keep improving. But I do highly recommend the program. Of course, as an adult choosing to do this program, I was very motivated to do it and get everything I could out of it, but they teach a whole new way of reading instead of just reading word by word, you start to create pictures at a sentence level, then multi-sentence, then paragraph, then multi-paragraphs, then a page, then multi-pages. I'd also be happy to talk to anyone about my experiences with hyperlexia. I'm also starting to look into ways to raise awareness of hyperlexia because I wish my teachers would have known about it and could have helped me at a younger age. Wow, thank you for sharing!! I have heard wonderful things about that program before. Please start a blog!! I am always looking for hyperlexic adults to follow and learn from. Not much available at the moment though! I hadn't considered starting a blog, but maybe I will! I've wanted to blog about books, and I could see it as a two for one - blog about hyperlexia through books in a sense. Hi Dyan, thank you so much for sharing all this valuable information, strategies and resources.I am deeply grateful with you! As you said there is not info available regarding Hyperlexia. My son is a sweet, smart and lovely Autistic 7 years old boy. He is hyperlexic since he was little and hypergrafic too! About hypergraphia there is not much info about it. I am still looking for more. Tomorrow I will advocate regarding his hyperlexia and hypergraphia at his IEP meeting.Nobody in the team knows about it. I thought they immediately notice or be curious but nobody seem to be familiar with hyperlexia at all. It's time to explain what hyperlexia is. My first grader son can read sight-words up to a 6th grade level. He is a self taught kid. He is a Logo expert! Maps! A ton of notebooks and white paper with his writings (he can do any type of font!) and drawing (all logos and brands you can imagine) Hewite and name all he knows and see! He is an expert researching things. Thank God for Google search, images and translator too ...they are his toys! He sounds like an amazing kid! I hope the IEP meeting went well! I am in tears right now. My son will be 3 in just a couple weeks, and I havr finally found something that describes him, perfectly! As soon as I read the license plates, I just burst into tears. This is my son. He speaks in letters and numbers, almost exclusively. If hes upset, he counts, often just repeating, 1-2, 1-2, 1-2. He loves shirts with writing. I swear he reads his books. Always has. He was 1.5 years old, and was sitting in a chair, with a book. It looked like he was actually reading. And he read the entire book. My husband and I laughed, thought it was adorable. Didn't think much else. We have both witnessed him reading. Of course, we never thought he actually was, buy now... I'm starting to think he is, and has been. He was mistaken for having a hearing issue. He acts like he doesn't ecen know his name. Rarely will even look at you, as you say his name over and over. Thank you so much for providing this information! I will be bringing this up at our appointment in a couple weeks. I'm scared, sad, relieved.... so many emotions right now. I just found all the answers I've been looking for! Oh goodness, I know how you feel. I felt the exact same way when I finally learned about hyperlexia. I'm so glad you have finally found what you have been looking for!! My son as I believe so, has almost all of the symptoms you have mentioned of being hyperlexic. How did you help him in this case? I just started to write stuff down more and using strategies that I mention in my book Beyond the Letters or that can be found on the hyperlexia resources page. Wow, your son sounds incredible!! Happy to meet you. And feel free to reach out any time! Oh my word. I just came across your blog and you've brought tears to my eyes. Our sons could be twins, they are so alike... even down to pointing out the numbers on the bottom of the street lights. Thank you so much for sharing your story and for posting all these resources!!!! THANK YOU! Thank you so very much for sharing. I am blessed to have found your post and now realize that there are more resources and actual names for these behaviors my ASD 3 year-old exhibits. I am trying to keep ahead of his needs and have been very concerned how pre-K and kindergarten would work for him and what I can do to place him in a way so he may use his gifts to the fullest.